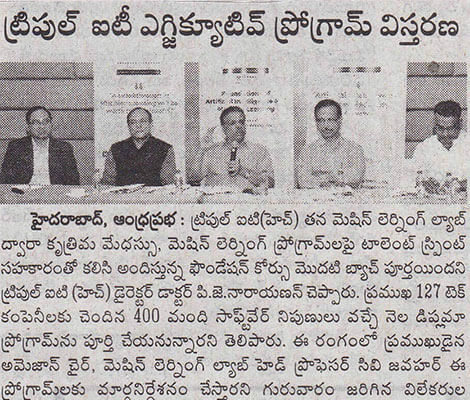 Over 1,000 tech professionals from Hyderabad and Bengaluru have enrolled for the programme in the first eight months of its launch. 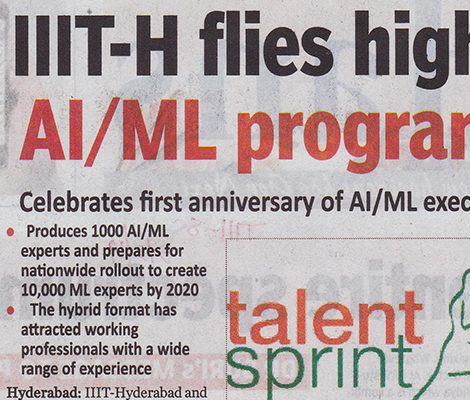 IIIT-H, in association with TalentSprint, offers an advanced certification programme to build Artificial Intelligence/ML expertise among 10,000 IT professionals. The agreement comes in the backdrop of traditional IT roles vanishing and companies betting big on AI and deep tech areas to further grow. 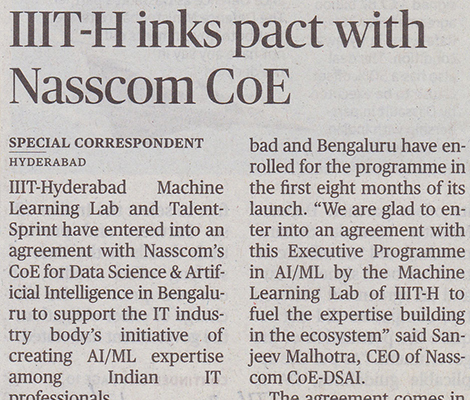 ÃƒÆ’Ã†â€™Ãƒâ€ Ã¢â‚¬â„¢ÃƒÆ’Ã¢â‚¬ ÃƒÂ¢Ã¢â€šÂ¬Ã¢â€žÂ¢ÃƒÆ’Ã†â€™ÃƒÂ¢Ã¢â€šÂ¬Ã…Â¡ÃƒÆ’Ã¢â‚¬Å¡Ãƒâ€šÃ‚Â¢ÃƒÆ’Ã†â€™Ãƒâ€ Ã¢â‚¬â„¢ÃƒÆ’Ã¢â‚¬Å¡Ãƒâ€šÃ‚Â¢ÃƒÆ’Ã†â€™Ãƒâ€šÃ‚Â¢ÃƒÆ’Ã‚Â¢ÃƒÂ¢Ã¢â€šÂ¬Ã…Â¡Ãƒâ€šÃ‚Â¬ÃƒÆ’Ã¢â‚¬Â¦Ãƒâ€šÃ‚Â¡ÃƒÆ’Ã†â€™ÃƒÂ¢Ã¢â€šÂ¬Ã…Â¡ÃƒÆ’Ã¢â‚¬Å¡Ãƒâ€šÃ‚Â¬ÃƒÆ’Ã†â€™Ãƒâ€ Ã¢â‚¬â„¢ÃƒÆ’Ã‚Â¢ÃƒÂ¢Ã¢â‚¬Å¡Ã‚Â¬Ãƒâ€šÃ‚Â¦ÃƒÆ’Ã†â€™Ãƒâ€šÃ‚Â¢ÃƒÆ’Ã‚Â¢ÃƒÂ¢Ã¢â€šÂ¬Ã…Â¡Ãƒâ€šÃ‚Â¬ÃƒÆ’Ã¢â‚¬Â¦ÃƒÂ¢Ã¢â€šÂ¬Ã…â€œWe are glad to enter into an agreement with this Executive Programme in AI/ML by the Machine Learning Lab of IIIT-H to fuel the expertise building in the ecosystemÃƒÆ’Ã†â€™Ãƒâ€ Ã¢â‚¬â„¢ÃƒÆ’Ã¢â‚¬ ÃƒÂ¢Ã¢â€šÂ¬Ã¢â€žÂ¢ÃƒÆ’Ã†â€™ÃƒÂ¢Ã¢â€šÂ¬Ã…Â¡ÃƒÆ’Ã¢â‚¬Å¡Ãƒâ€šÃ‚Â¢ÃƒÆ’Ã†â€™Ãƒâ€ Ã¢â‚¬â„¢ÃƒÆ’Ã¢â‚¬Å¡Ãƒâ€šÃ‚Â¢ÃƒÆ’Ã†â€™Ãƒâ€šÃ‚Â¢ÃƒÆ’Ã‚Â¢ÃƒÂ¢Ã¢â€šÂ¬Ã…Â¡Ãƒâ€šÃ‚Â¬ÃƒÆ’Ã¢â‚¬Â¦Ãƒâ€šÃ‚Â¡ÃƒÆ’Ã†â€™ÃƒÂ¢Ã¢â€šÂ¬Ã…Â¡ÃƒÆ’Ã¢â‚¬Å¡Ãƒâ€šÃ‚Â¬ÃƒÆ’Ã†â€™Ãƒâ€ Ã¢â‚¬â„¢ÃƒÆ’Ã‚Â¢ÃƒÂ¢Ã¢â‚¬Å¡Ã‚Â¬Ãƒâ€¦Ã‚Â¡ÃƒÆ’Ã†â€™ÃƒÂ¢Ã¢â€šÂ¬Ã…Â¡ÃƒÆ’Ã¢â‚¬Å¡Ãƒâ€šÃ‚Â said Sanjeev Malhotra, CEO of Nasscom CoE-DSAI. 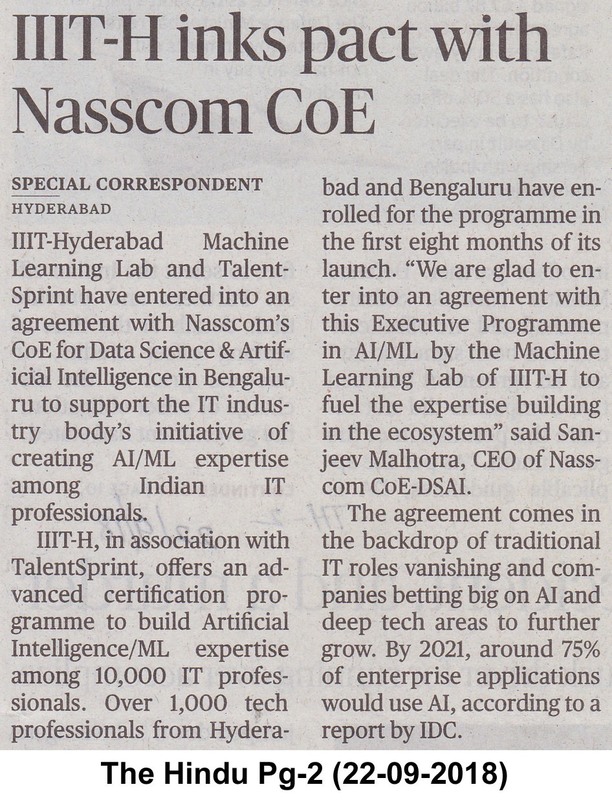 IIIT-Hyderabad Machine Learning Lab and TalentSprint have entered into an agreement with NasscomÃƒÆ’Ã†â€™Ãƒâ€ Ã¢â‚¬â„¢ÃƒÆ’Ã¢â‚¬ ÃƒÂ¢Ã¢â€šÂ¬Ã¢â€žÂ¢ÃƒÆ’Ã†â€™ÃƒÂ¢Ã¢â€šÂ¬Ã…Â¡ÃƒÆ’Ã¢â‚¬Å¡Ãƒâ€šÃ‚Â¢ÃƒÆ’Ã†â€™Ãƒâ€ Ã¢â‚¬â„¢ÃƒÆ’Ã¢â‚¬Å¡Ãƒâ€šÃ‚Â¢ÃƒÆ’Ã†â€™Ãƒâ€šÃ‚Â¢ÃƒÆ’Ã‚Â¢ÃƒÂ¢Ã¢â€šÂ¬Ã…Â¡Ãƒâ€šÃ‚Â¬ÃƒÆ’Ã¢â‚¬Â¦Ãƒâ€šÃ‚Â¡ÃƒÆ’Ã†â€™ÃƒÂ¢Ã¢â€šÂ¬Ã…Â¡ÃƒÆ’Ã¢â‚¬Å¡Ãƒâ€šÃ‚Â¬ÃƒÆ’Ã†â€™Ãƒâ€ Ã¢â‚¬â„¢ÃƒÆ’Ã¢â‚¬Å¡Ãƒâ€šÃ‚Â¢ÃƒÆ’Ã†â€™Ãƒâ€šÃ‚Â¢ÃƒÆ’Ã‚Â¢ÃƒÂ¢Ã¢â€šÂ¬Ã…Â¡Ãƒâ€šÃ‚Â¬ÃƒÆ’Ã¢â‚¬Â¦Ãƒâ€šÃ‚Â¾ÃƒÆ’Ã†â€™ÃƒÂ¢Ã¢â€šÂ¬Ã…Â¡ÃƒÆ’Ã¢â‚¬Å¡Ãƒâ€šÃ‚Â¢s CoE for Data Science & Artificial Intelligence in Bengaluru to support the IT industry bodyÃƒÆ’Ã†â€™Ãƒâ€ Ã¢â‚¬â„¢ÃƒÆ’Ã¢â‚¬ ÃƒÂ¢Ã¢â€šÂ¬Ã¢â€žÂ¢ÃƒÆ’Ã†â€™ÃƒÂ¢Ã¢â€šÂ¬Ã…Â¡ÃƒÆ’Ã¢â‚¬Å¡Ãƒâ€šÃ‚Â¢ÃƒÆ’Ã†â€™Ãƒâ€ Ã¢â‚¬â„¢ÃƒÆ’Ã¢â‚¬Å¡Ãƒâ€šÃ‚Â¢ÃƒÆ’Ã†â€™Ãƒâ€šÃ‚Â¢ÃƒÆ’Ã‚Â¢ÃƒÂ¢Ã¢â€šÂ¬Ã…Â¡Ãƒâ€šÃ‚Â¬ÃƒÆ’Ã¢â‚¬Â¦Ãƒâ€šÃ‚Â¡ÃƒÆ’Ã†â€™ÃƒÂ¢Ã¢â€šÂ¬Ã…Â¡ÃƒÆ’Ã¢â‚¬Å¡Ãƒâ€šÃ‚Â¬ÃƒÆ’Ã†â€™Ãƒâ€ Ã¢â‚¬â„¢ÃƒÆ’Ã¢â‚¬Å¡Ãƒâ€šÃ‚Â¢ÃƒÆ’Ã†â€™Ãƒâ€šÃ‚Â¢ÃƒÆ’Ã‚Â¢ÃƒÂ¢Ã¢â€šÂ¬Ã…Â¡Ãƒâ€šÃ‚Â¬ÃƒÆ’Ã¢â‚¬Â¦Ãƒâ€šÃ‚Â¾ÃƒÆ’Ã†â€™ÃƒÂ¢Ã¢â€šÂ¬Ã…Â¡ÃƒÆ’Ã¢â‚¬Å¡Ãƒâ€šÃ‚Â¢s initiative of creating AI/ML expertise among Indian IT professionals. 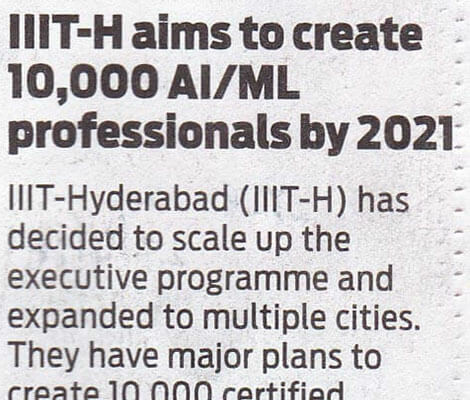 The International Institute of Information Technology, Hyderabad (IIIT-H) today announced expansion of its programme offered in association with TalentSprint in Artificial Intelligence (AI) and Machine Learning (ML) for technology professionals. The institute also announced that its ongoing partnership with TalentSprint is now ready for scale-up. 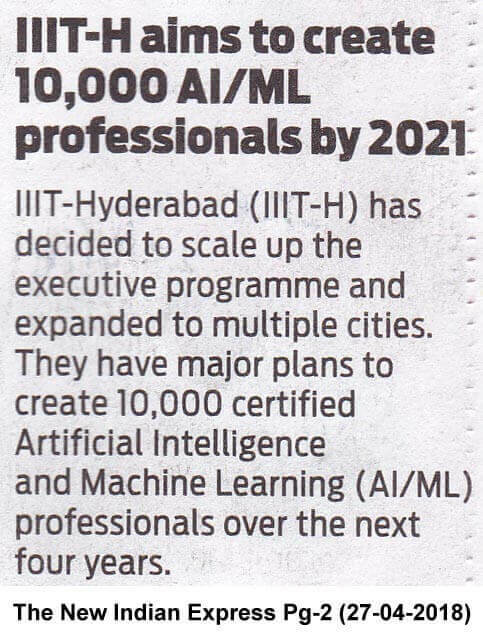 The International Institute of Information Technology, Hyderabad (IIIT-H) today announced expansion of its programme offered in association with TalentSprint in Artificial Intelligence (AI) and Machine Learning (ML) for technology professionals. 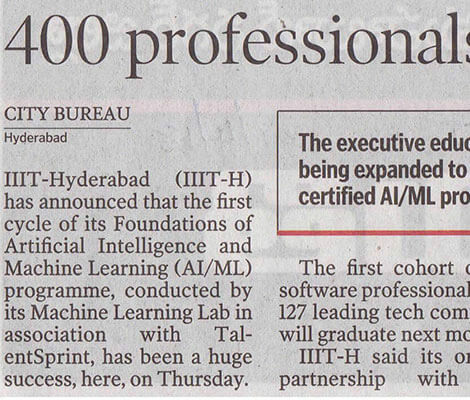 IIIT-H said the first cycle of its Foundations of Artificial Intelligence and Machine Learning (AI/ML) conducted by its Machine Learning Lab in partnership with TalentSprint has been a success and the first cohort of 400 software professionals from 127 tech companies will graduate next month. The institute also announced that its ongoing partnership with TalentSprint is now ready for scale-up. The executive education programme is being expanded to multiple cities to create 10,000 certified AI/ML professionals over the next four years, it said. 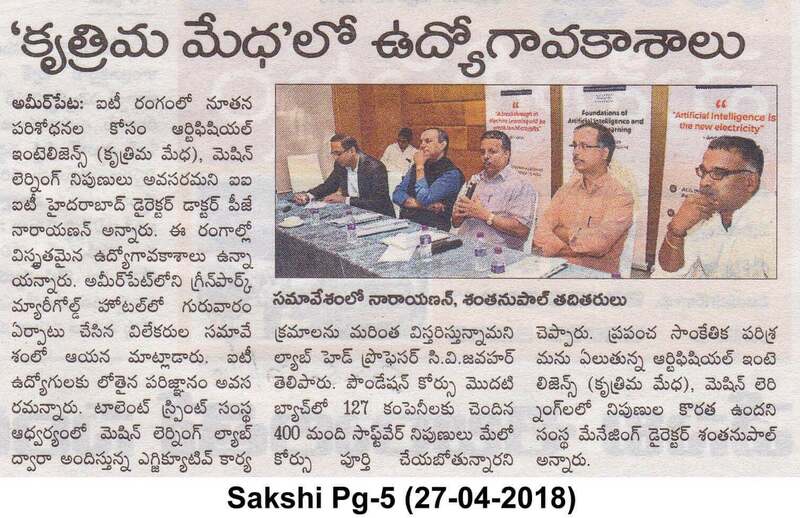 IIIT-H, Director, P J Narayanan, said AI/ML is a deep and disruptive technology and we are making it accessible and digestible to industry professionals from diverse technology backgrounds. We have decided to roll out this executive programme on AI and Machine Learning on a much larger scale in partnership with TalentSprint. TalentSprint managing director and CEO, Santanu Paul said AI/ML technologies are rewriting the entire narrative of the software industry. Even globally, there is a huge expertise gap. The scale-up we are announcing today will make it the largest executive education initiative in the field of AI/ML. 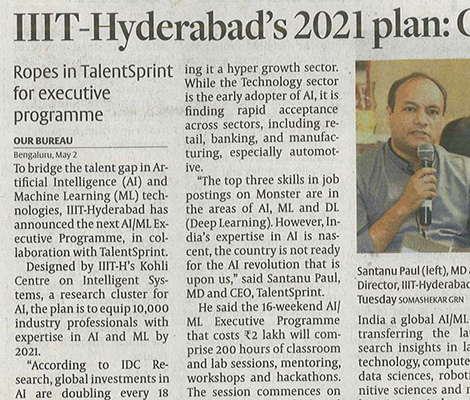 The International Institute of Information Technology,Hyderabad(IIIT-H) today announced expansion of its programme offered in association with TalentSprint in Artificial Intelligence(AI) and Machine Learning (ML) for technology professionals. 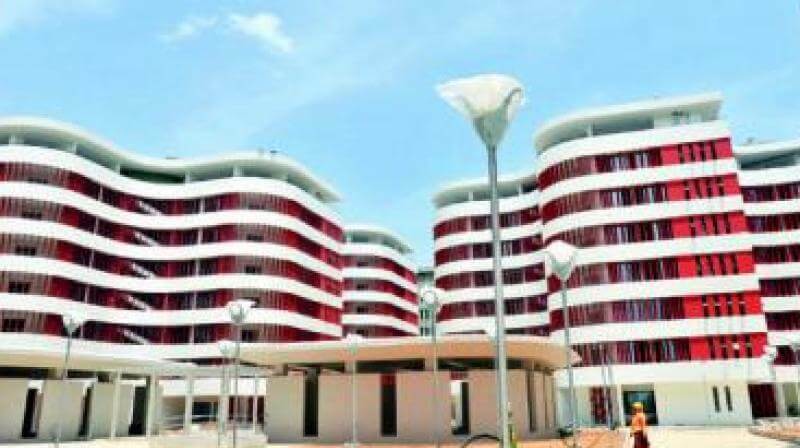 IIIT-H said the first cycle of its Foundations of Artificial Intelligence and Machine Learning(AI/ML) conducted by its Machine Learning Lab in partnership with TalentSprint has been a success and the first cohort of 400 software professionals from 127 tech companies will graduate next month. "The executive education programme is being expanded to multiple cities to create 10,000 certified AI/ML professionals over the next four years," it said. 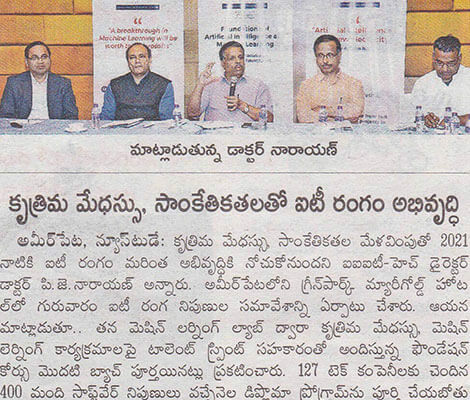 IIIT-H, Director, P J Narayanan, said "AI/ML is a deep and disruptive technology and we are making it accessible and digestible to industry professionals from diverse technology backgrounds. We have decided to roll out this executive programme on AI and Machine Learning on a much larger scale in partnership with TalentSprint." TalentSprint managing director and CEO,Santanu Paul said "AI/ML technologies are rewriting the entire narrative of the software industry.Even globally, there is a huge expertise gap. The scale-up we are announcing today will make it the largest executive education initiative in the field of AI/ML. The executive education program is being expanded to multiple cities to create 10K certified AI/ML professionals over the next four years. 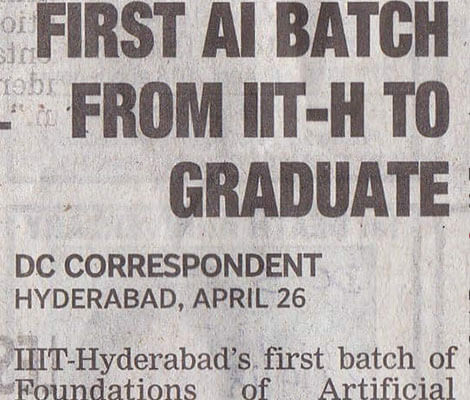 Hyderabad:IIIT-Hyderabads first batch of Foundations of Artificial Intelligence and Machine Learning (AI/ML) program, conducted by its Machine Learning Lab from 127 leading tech companies will graduate next month. The executive education program is being expanded to multiple cities to create 10,000 certified AI/ML professionals over the next four years. Dr. P. J. Narayanan, director, IIIT-H, We are very encouraged by the enthusiastic response from participants who are hailing the design, delivery, and effectiveness of the program as a game changer. We have decided to roll out this executive program on AI on a much larger scale in partnership with TalentSprint. 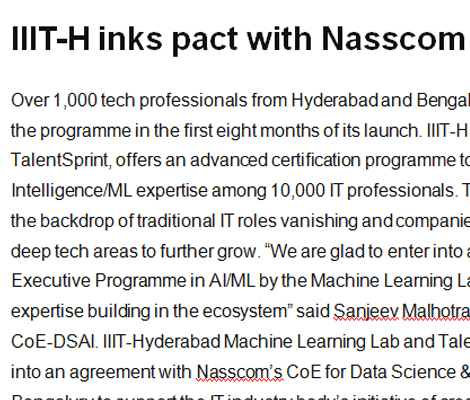 IIIT-Hyderabad Machine Learning Lab and TalentSprint have entered into an agreement with Nasscoms centre of excellence for Data Science & Artificial Intelligence (CoE-DSAI) in Bengaluru as an ecosystem knowledge partner. 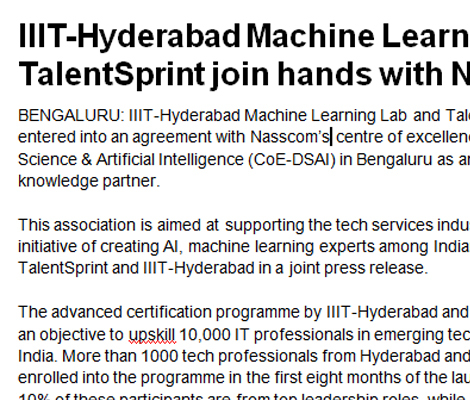 This association is aimed at supporting the tech services industry body initiative of creating AI, machine learning experts among Indian IT workers, said TalentSprint and IIIT-Hyderabad in a joint press release. 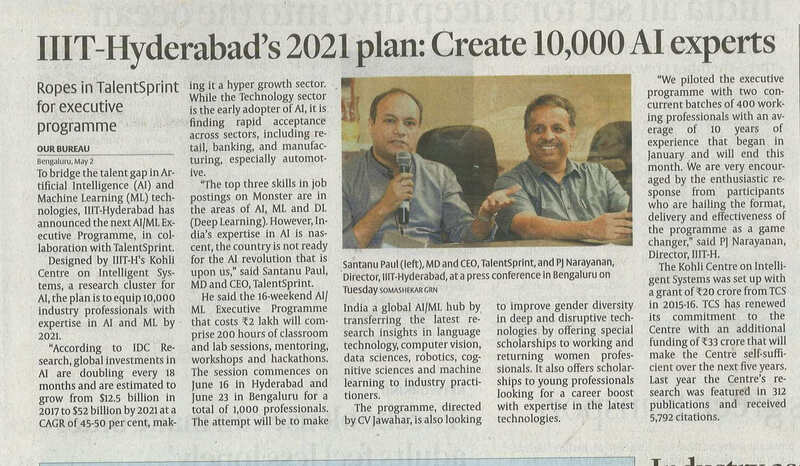 The advanced certification programme by IIIT-Hyderabad and TalentSprint has an objective to upskill 10,000 IT professionals in emerging technology areas in India. 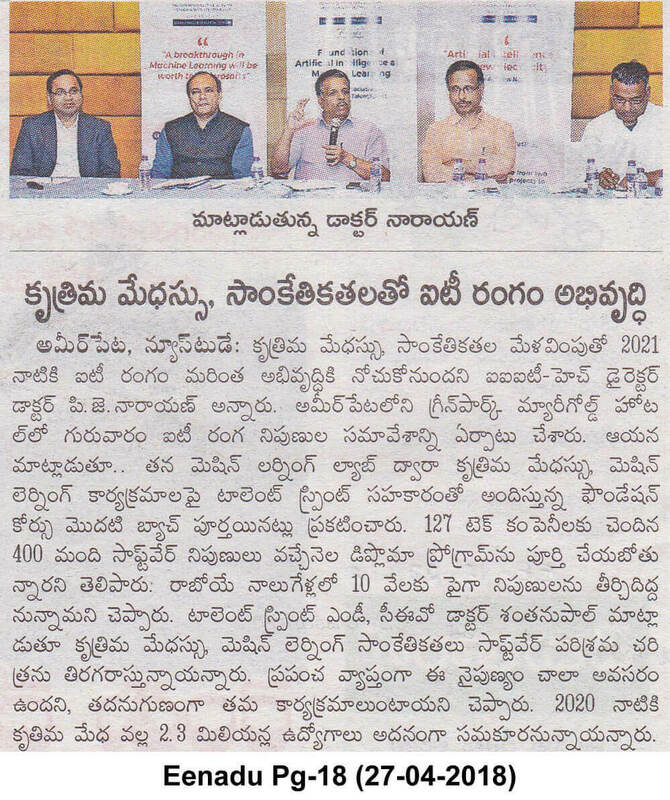 More than 1000 tech professionals from Hyderabad and Bengaluru have enrolled into the programme in the first eight months of the launch. While about 10% of these participants are from top leadership roles, while 35% are from startups and mid-sized companies, and remaining from large companies, according to the release. Average experience of participants is seven years and they are currently working with more than 380 global organizations. “Nasscom CoE-DSAI was launched with an objective of establishing India to be a global DSAI destinations by 2022. 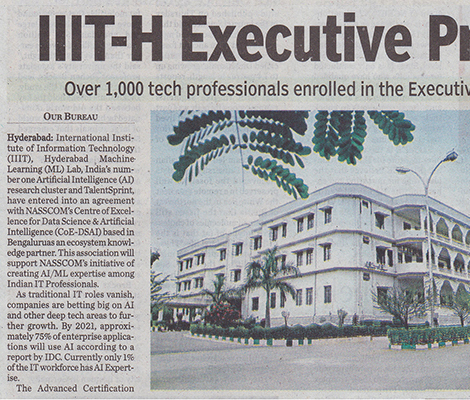 Industry will need 150,000 experts in Data Science and Artificial Intelligence to enable this objective, said Sanjeev Malhotra, CEO at Nasscom CoE-DSAI, adding that the advanced certification programme by the Machine Learning Lab of IIIT-H is expected to fuel expertise building. 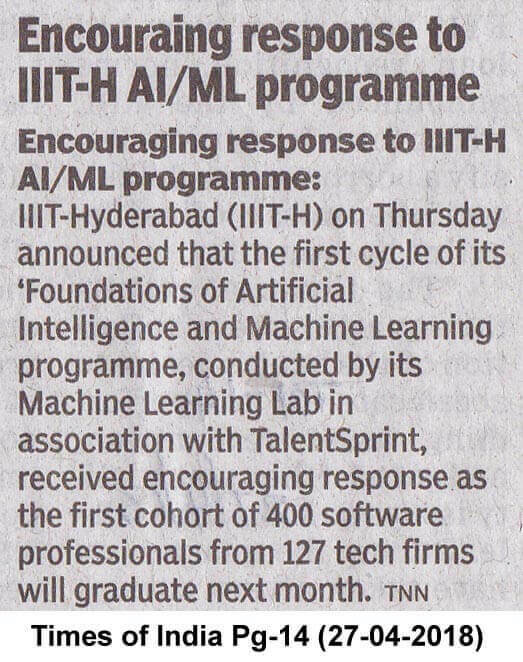 IIIT-Hyderabad announced that the first cycle of its Foundations of Artificial Intelligence and Machine Learning (AI/ML) program, conducted by its Machine Learning Lab in association with TalentSprint, has been a great success. The first set of 400 software professionals from 127 leading tech companies would graduate next month. The program is directed by C.V. Jawahar, Amazon Chair professor and head of IIIT-H Machine Learning Lab, a leading authority in the field. 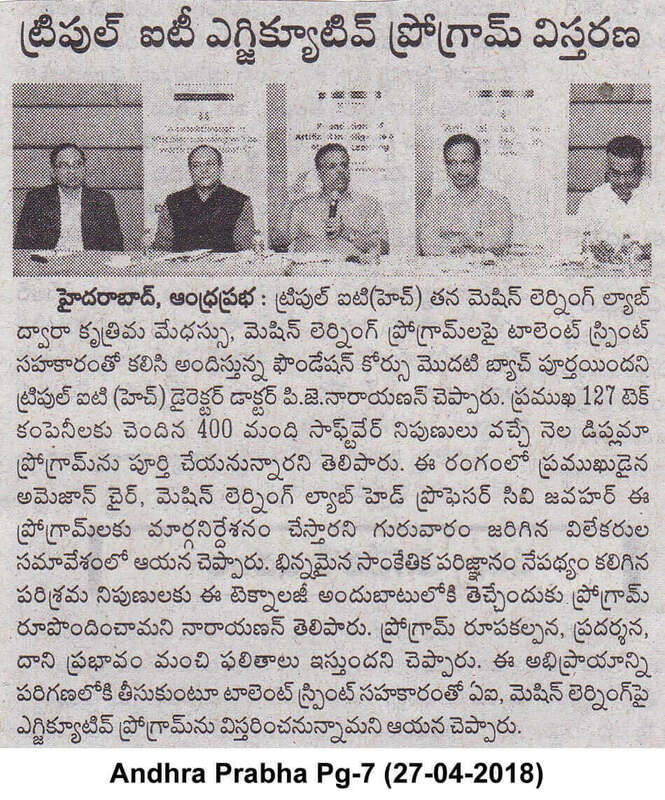 At a press conference here on Thursday, IIIT-H Director P.J. Narayanan and TalentSprint MD and CEO Santanu Paul said the ongoing partnership executive education programme is being expanded to multiple cities to create 10,000 certified AI/ML professionals over the next four years. AI/ML is a deep and disruptive technology and we are making it accessible to industry professionals from diverse technology backgrounds. Encouraged by the enthusiastic response from participants, we have decided to take it on a massive scale, said Mr. Narayanan. Mr. Paul said the AI/ML technologies were rewriting the entire narrative of the software industry, but there was a huge expertise gap globally with not more than 10,000 professionals with mastery over AI/ML technologies. 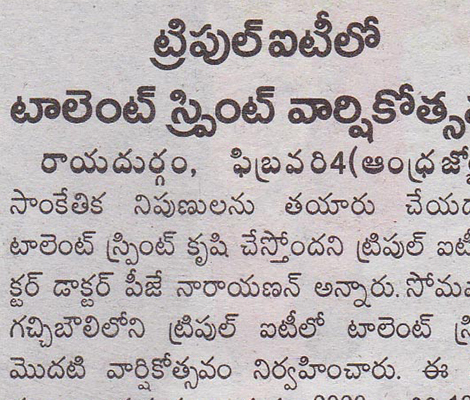 Hyderabad: IIIT-Hyderabad (IIIT-H) has announced that the first cycle of its foundations of Artificial Intelligence and Machine Learning (AI/ML) program, conducted by its Machine Learning Lab, has been a great success. 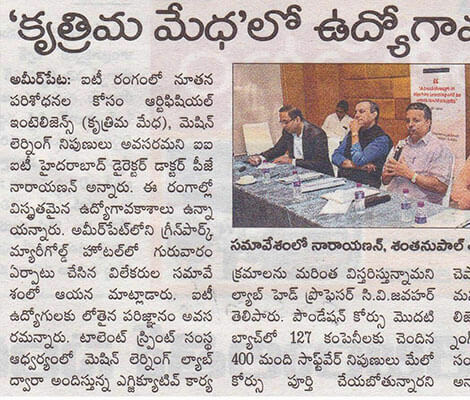 The first cohort of 400 software professionals from 127 leading tech companies will graduate next month. The program is directed by Prof CV Jawahar, Amazon Chair Professor and Head of the IIIT-H Machine Learning Lab, a leading authority in the field. 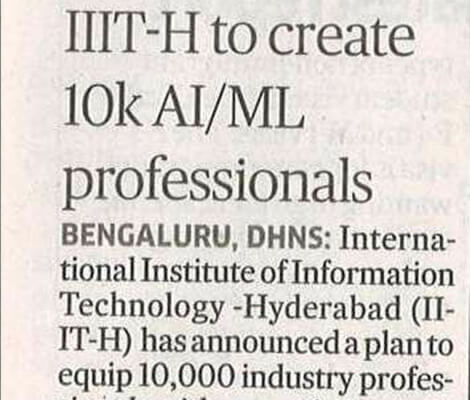 IIIT-H further announced that its ongoing partnership with Talent Sprint is now ready for scale. The executive education program is being expanded to multiple cities to create 10,000 certified AI/ML professionals over the next four years. The goal is to close the gap between state-of-art academic research and state-of-practice industry projects in terms of AI and ML expertise. Dr PJ Narayanan, Director, IIIT-H said AI/ML is a deep and disruptive technology and we are making it accessible and digestible to industry professionals from diverse technology backgrounds. We are very encouraged by the enthusiastic response from participants who are hailing the design, delivery, and effectiveness of the program as a game changer. Dr. Santanu Paul, MD & CEO, Talent Sprint, AI/ML technologies are rewriting the entire narrative of the software industry. Even globally, there is a huge expertise gap. The program's hybrid structure designed by the IIIT-H Machine Learning Lab, with its judicious blend of research and practice-based modules, created a strong appeal among working professionals. The intense nature of the program with lectures by globally renowned AI and ML faculty, case studies by industry practitioners, hands-on lab exercises, high-energy hackathons and ongoing mentorship offered a unique environment and design where learning-by-doing became the norm. 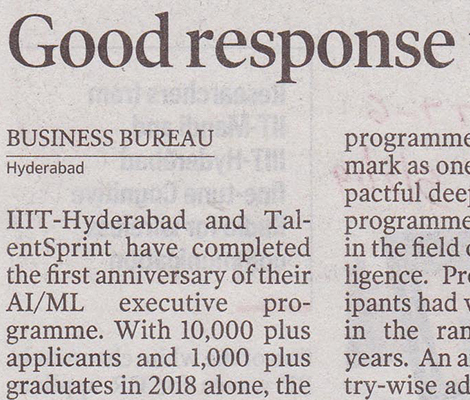 Commenting on the occasion, Dr Santanu Paul, CEO and MD of TalentSprint said: "We were delighted with the rapid adoption of AI/ML among working professionals in Bengaluru and Hyderabad. We are constantly investing in making the program more comprehensive, more compelling, and more cutting-edge. We believe this is already the biggest source of high-end AI/ML talent in the country today and we intend to make it a national phenomenon in 2019." The International Institute of Information Technology, Hyderabad (IIIT-H) is an autonomous research university founded in 1998 that focuses on the core areas of Information Technology, such as Computer Science, Electronics and Communications, and their applications in other domains through interdisciplinary research that has a greater social impact. Some of its research domains include Visual Information Technologies, Human Language Technologies, Data Engineering, VLSI and Embedded Systems, Computer Architecture, Wireless Communications, Algorithms and Information Security, Robotics, Building Science, Earthquake Engineering, Computational Natural Sciences and Bioinformatics, Education Technologies, Power Systems, IT in Agriculture and e-Governance. TalentSprint is a new-age digital platform to transform the lives of young and experienced professionals. Its hybrid boot camps empower professionals with high-end disruptive technologies. The AI-powered digital platform enables professionals to get ahead and stay ahead in a hypercompetitive world. Funded by Nexus Venture Partners and the National Skill Development Corporation, TalentSprint aims to empower ONE MILLION professionals by 2020. The programÃƒÂ¢Ã¢â€šÂ¬Ã¢â€žÂ¢s hybrid structure designed by the IIIT-H Machine Learning Lab, with its judicious blend of research and practice-based modules, created a strong appeal among working professionals. The intense nature of the program with lectures by globally renowned AI and ML faculty, case studies by industry practitioners, hands-on lab exercises, high-energy hackathons and ongoing mentorship offered a unique environment and design where learning-by-doing became the norm. 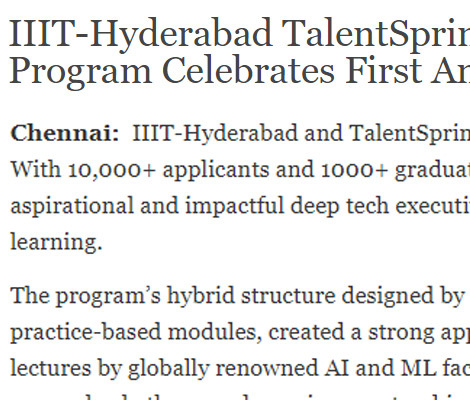 Chennai: IIIT-Hyderabad and TalentSprint have completed the first anniversary of their AI/ML Executive Program. With 10,000+ applicants and 1000+ graduates in 2018 alone, the program has made its mark as one of the most aspirational and impactful deep tech executive programs in the country in the field of artificial intelligence and machine learning. The Hybrid Format has attracted Working Professionals with a Wide Range of Experience February 4, 2019. 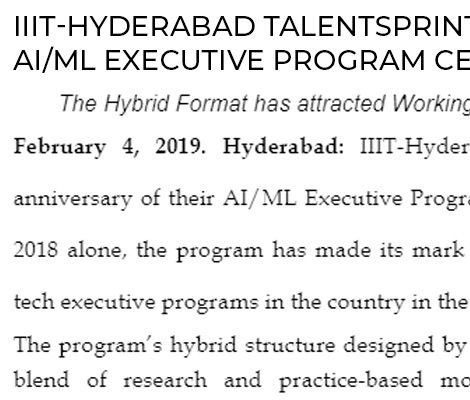 Hyderabad: IIIT-Hyderabad and TalentSprint have completed the first anniversary of their AI/ML Executive Program. With 10,000+ applicants and 1000+ graduates in 2018 alone, the program has made its mark as one of the most aspirational and impactful deep tech executive programs in the country in the field of artificial intelligence and machine learning. The International Institute of Information Technology, Hyderabad (IIIT-H) is an autonomous research university founded in 1998 that focuses on the core areas of Information Technology, such as Computer Science, Electronics and Communications, and their applications in other domains through inter disciplinary research that has a greater social impact. Some of its research domains include Visual Information Technologies, Human Language Technologies, Data Engineering, VLSI and Embedded Systems, Computer Architecture, Wireless Communications, Algorithms and Information Security, Robotics, Building Science, Earthquake Engineering, Computational Natural Sciences and Bioinformatics, Education Technologies, Power Systems, IT in Agriculture and e-Governance. 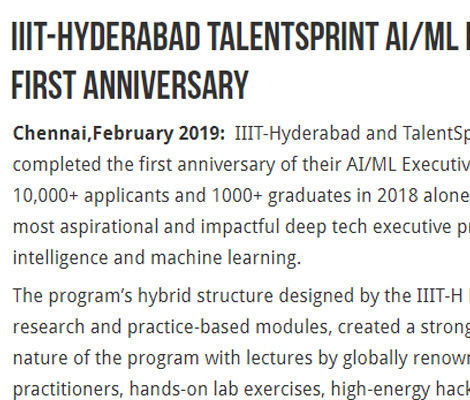 IIIT-Hyderabad and TalentSprint have completed the first anniversary of their AI/ML Executive Program. With 10,000+ applicants and 1000+ graduates in 2018 alone, the program has made its mark as one of the most aspirational and impactful deep tech executive programs in the country in the field of artificial intelligence and machine learning. The program's hybrid structure designed by the IIIT-H Machine Learning Lab, with its judicious blend of research and practice-based modules, created a strong appeal among working professionals. The intense nature of the program with lectures by globally renowned AI and ML faculty, case studies by industry practitioners, hands-on lab exercises, high-energy hackathons and ongoing mentorship offered a unique environment and design where learning-by-doing became the norm. Speaking on the Anniversary, Prof. P. J. Narayanan, Director of IIIT-Hyderabad said: "We are very impressed with the mix of participants across industries and range of roles. This diversity has enabled us to bring the best out of the program. We realize the immense shortage of talent in this field and are committed to enable 10,000 tech professionals with our globally renowned expertise and reputation in the field of AI and ML. 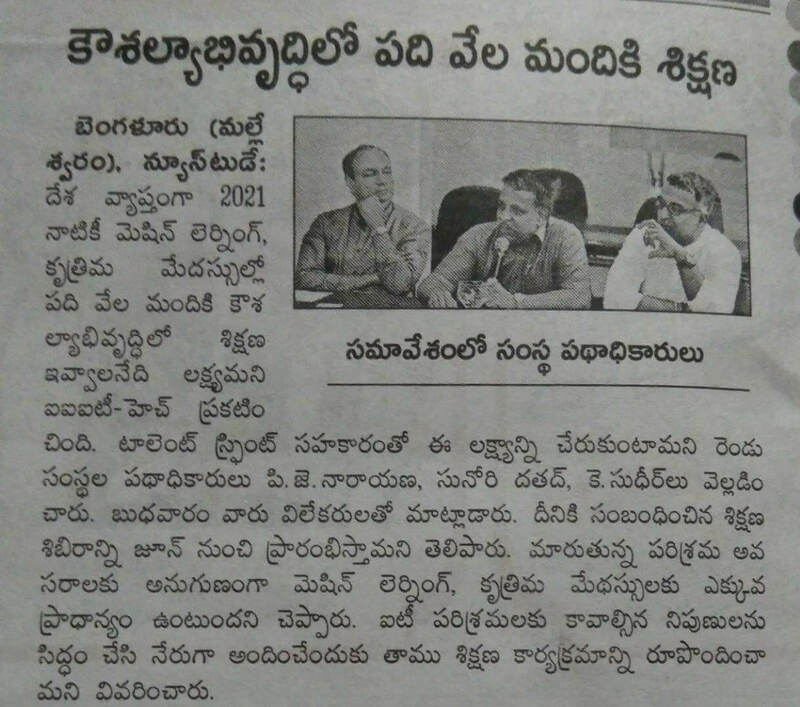 We are therefore preparing ourselves to take this program to professionals beyond Bengaluru and Hyderabad in 2019." 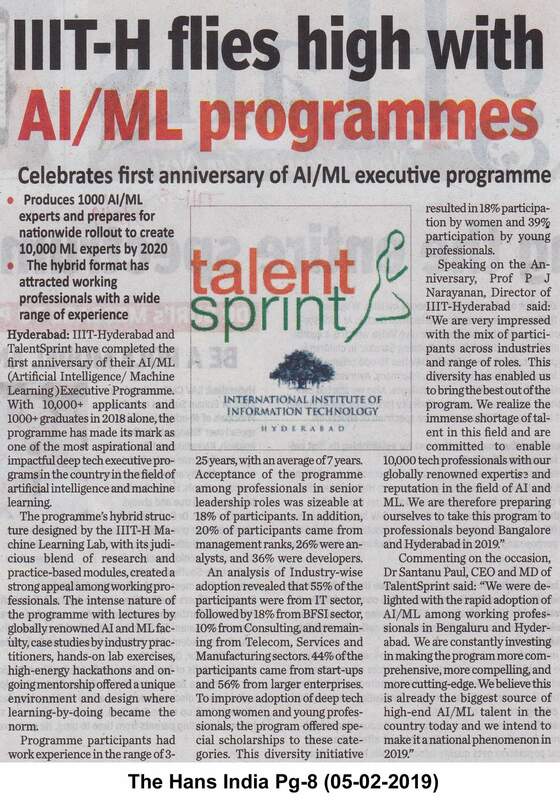 Commenting on the occasion, Dr Santanu Paul, CEO and MD of TalentSprint said: "We were delighted with the rapid adoption of AI/ML among working professionals in Bengaluru and Hyderabad. We are constantly investing in making the program more comprehensive, more compelling, and more cutting-edge. We believe this is already the biggest source of high-end AI/ML talent in the country today and we intend to make it a national phenomenon in 2019.